Cathedral Rock at Sedona | NJNA is Blogging! Today was the beginning of class number two and what a great one it is! It is another scene but the picture is handled in a different way. 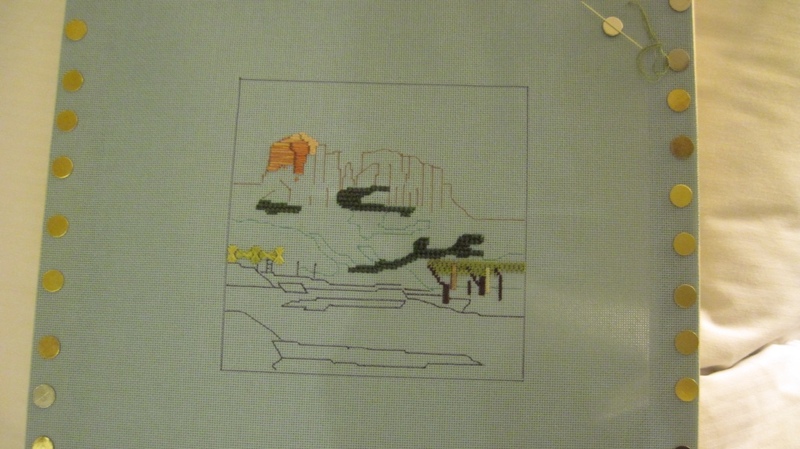 The scene is simpler and the shading is created by blending the threads in thread painting. Because there are fewer sections of the scene, the pace to teach all of them is much less frenetic. One concept that she taught was on straightening threads for laying threads in the thread painting. Her technique was taught to us by Sue R.! I felt so smart that I already knew it. Sue told us to take one of the hair straightening irons and run the threads through the “iron”. It works great on cotton, silk and synthetic threads. And no waiting for the threads to dry as was necessary the old fashioned way. You can see the lines that were drawn for us on the canvas showing the different sections of the design. Today we worked on the shrubs, rocks, tree trunks and two sections of the tree leaves. One of the things I have most appreciated is that instead of compensating for the cross stitch shrubs, she has us using the continental stitch. Let’s see what tomorrow brings.